In 1894, H.G. 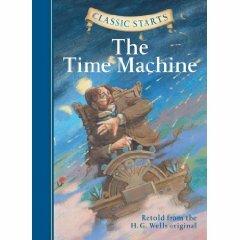 Wells published his novel The Time Machine, which, while short and simplistic, was in interesting thought experiment regarding mankind’s hopes for the future. Wells, a student of Marx, expressed a belief through metaphor that there could never be true equality, and there would always be those above, and those who served them. None the less, he told an ironic tale of how those on top would eventually get theirs. Wells’ novel was made into a movie by George Pal. The film was released in 1960. A second version, starring Guy Pierce and Directed by Simon Wells, H.G.’s grandson, was released in 2002. I have yet to meet someone, besides me, who has read/seen all three versions, which is really too bad. People often ask me which version is the best. The truth is, it’s really hard to pick one, because they are all so different, and each one is strangely apropriate to their time. You might say, reading the book and then watching the movies is a trip through time in itself. I’ll explain. In the book, the “Time Traveller,” who is never named, believes that if he travels far enough into the future, he will find mankind in a perfect state. No further explanation of this belief is ever given. Wishing to see mankind’s triumph, his first time-trip is a non-stop journey to the year A.D. 802,701. (Does this seem strange to anyone else? I mean, there’s a reason the Wright Bothers didn’t take their first flight over the Grand Canyon, and early sailors didn’t try to cross the Atlantic.) Once he stops, the Time Traveller first meets the Eloi, a society of childlike people. 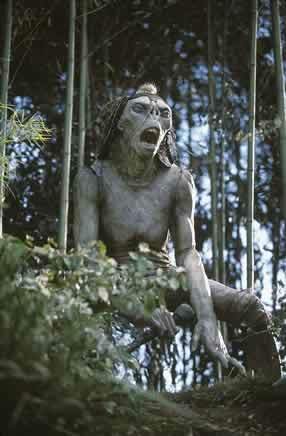 They live in small communities in futuristic yet deteriorating buildings, doing no work and eating a frugivorous diet. His efforts to communicate are hampered by their lack of curiosity or discipline, and he concludes that they are the result of humanity conquering nature with technology, and adapting to an environment in which strength and intellect are no longer advantageous. machine has been dragged into a nearby Sphynx with heavy doors, locked from the inside. Later, he is approached menacingly by the Morlocks, pale, apelike people who live underground, where he discovers the machinery and industry that make the above-ground paradise possible. He alters his theory, speculating that the human race has evolved into two species: the leisured classes have become the ineffectual Eloi, and the downtrodden working classes have become the brutish, light-fearing Morlocks. Deducing that the Morlocks have taken his time machine, he explores the Morlock tunnels, learning that they feed on the Eloi. His revised analysis is that their relationship is not one of lords and servants but of livestock and ranchers, and with no real challenges facing either species, they have both lost the intelligence and character of Man. (both played by Alan Young). He learns that Philby has been killed in the First World War. Obviously, he decides to keep going. Back in the Time Machine, he makes a brief stop in 1940, where he sees London being bombed by the Nazis. He then continues to 1966 (six years in the future at that time) where he sees everyone walking around in radiation suits. He once again meets Philby’s son, who remarks that he saw George on the same spot in the same clothes 52 years before. Sirens begin blaring and every one runs, shouting “get to the shelter!” Philby points to the sky and says to George, “There, an atomic satelite zeroing in!” He tries to drag George to the shelter, but George refuses to leave his Machine, so Philby abandons him and runs for safety. Seconds later, a blast rips through London, resulting in some impressive (for 1960) miniature work. George, narrating, lamants “The labor of centuries gone in an instant!” A lava flow heads for the Time Machine, and George has to rush to activate it before the flood hits. He suddenly finds himself traveling through time inside a wall of rock. He is forced to keep traveling through time at breakneck speed, lest he be crushed. Unable to move his machine in space, he has no choice but to wait for time to wear down the mountain he is inside of. generations of men struggeling and sacraficing, and for what? So you can swim and dance and play! I’m going back to my own time. I won’t tell them about the useless struggle, but at least I can die among men!” Upon attempting this however, he finds that his Machine has again been dragged into the Sphynx and he is trapped. In this version, the Morlocks provide the Eloi with food and clothing, as in the book. However, instead of snatching them one at a time, they use (of all things) air-raid sirens to lure them underground in droves (left). 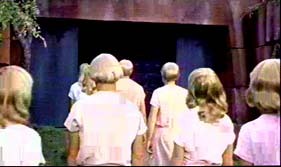 In one scene, the siren cuts off, and the door to the Morlocks’ slaughter house slams shut, denying entrance to the Eloi still outside. George shakes one who seems to be in a trance (below), and the Eloi tells him “it is all clear,” meaning the air raid has ended, essentially. 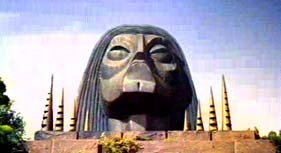 Apparently, the Morlocks are able to do this because humans are so conditioned from fleeing underground at the sound of sirens ever since 1960. Eventually, a girl named Weena (Yvette Mimieux) leads George to a room full of “talking rings” which seem to be surviving records of Earth’s past. The rings hold the voices of people describing nuclear and other wise horrible wars; the last recording annouces that Earth’s atmosphere has been all but destroyed and most of the human race is fleeing underground to escape the Sun’s harmful rays. A few have decided to “take our chances in the sunlight, however small they might be.” George deduces that those who fled underground were the ancestors of the Morlocks and those who remained were the ancestors of the Eloi. 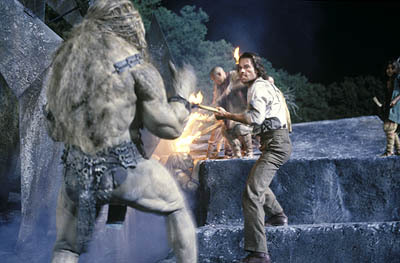 George fights the Morlocks in their labyrinth. conspicuously lacking here, which may be why the script calls for George and the Eloi to triumph over the Morlocks. While the Traveler simply returned to his own time in despair of Man’s future, George follows his beloved Weena into the Morlocks’ slaughterhouse. Once there, he is able to inspire the Eloi to join him in fighting against the Morlocks. 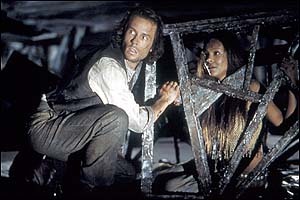 Once they escape, at George’s direction, they throw large amounts of dry wood down the wells that connect the surface to the underground to stoke an underground inferno. The Morlocks’ lair caves in. Shortly after, George returns to his own time and tells the tale of his adventure to several collegues who leave, scoffing at him. Except Philby. A few minutes later, Philby and George’s housekeeper (Doris Lloyd) discover that George has once again disapeared in his Time Machine, and that he has taken three books from his library with him. Having searched for his purpose for years, George has apparently found it in rebuilding civilization in A.D. 802,701. And, of course, being with Weena. "In a week, we'll have never have had this conversation." dresses in his best and gets into a chair with parasol-like apparati above and below it that spin, generating a sphere around the machine in which time does not pass. The scene changes before we see his journey. He goes back to the night Emma died, meets her, and steers her away from the park. He extracts a promise from her to go home and stay there until morning. Just when he thinks he has triumphed, a model T goes hay wire and runs her over. 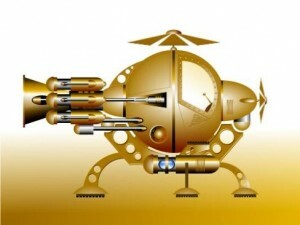 The Time Machine of 2002, often mistaken for a coffee maker. rolls its eyes. Disapointed, Alex gets back into the time machine and travels forward another 7 years. When he sees chaos around him, he stops. Military vehicels race through the streets, and the ground shakes violently. Upon dismounting, Alex is accoasted by several soldiers who urge him to come with them underground. He demands to know what’s going on, assuring them “Yes, I’ve been living under a rock!” They tell him that the demolitions for the lunar colony over the past 7 years have changed the moon’s orbit, and caused the moon to start breaking up. Alex looks skyward and sees the moon, much larger than ususal, and riddled with cracks. At that moment a crack opens in the earth. Alex races to his Machine before the crack destroys it, and mangaes to throw it into gear just in time. However, his Machine is rocked by the disaster, and he hits his head, and is knocked uncouncious. Out of control, the Machine hurtles through time. We see glacers come and go and the ground rise above the timeless sphere and then fall back below it. Rivers carve canyons in the blink of an eye. Alex eventually regains conciousness just long enough to stop the Machine at (you guessed it) A.D. 802,701, before slipping back into oblivion. He awakens in a bed somewhere with a bandage on his head. He walks out into a community of huts built on the side of a cliff. He is confronted by people he is unable to communicate with, until a woman named Mara (Samantha Mumba) asks “Do you know my words?” in perfect English. It turns out that the Eloi in this version have discovered “the Stone Language” carved in stone and concrete relics from our time, and have kept it alive as a tradition. Most Eloi lose the ability to speak it by adulthood, but Mara teaches children, so she has retained it. Guy Pierce gets mideval in the 8000th century. 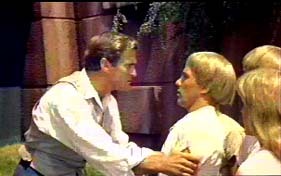 attack, Alex demands to know why the Eloi will not fight back. An Eloi replies “those who … ‘fight’ are taken first.” So between 1894 and 2002, the relationship has made a full transition from ironic justice to shameless opression. The Eloi lack technology not because of laziness, but because the Morlocks use coordinated attacks to keep them helpless. The end result, however, is essentially the same, as Alex finds out. He discovers Photonic again, its panes of glass tarnished and cracked, but still functional (after 800,000 years. Right). Photonic directs him to the statue he dreamed of, this version’s Sphynx. He climbs down into it and discovers a grizly slaughterhouse scene that audiences were spared in 1960. 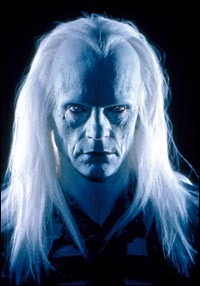 After being captured, he sees Mara locked in a cage and meets the “Uber Morlock,” brilliantly played by Jeremy Irons, though he is well hidden in a great makeup job. Spy Morlocks mark targets for Hunters. The hunter Morlocks are bred to be predators but also to be controlled. The Uber Morlock is of a cast that concentrated on expanding its cerebral abilities. He says that without control the hunters would exhaust the food supply in a matter of months. He also controlls the Eloi and keeps them fearful. The Uber Morlock calls Alex by name and knows who he is and why he has traveled through time. He also projects pictures into Alex’s head, putting him back in his laboratory with Emma. Alex learns learns that some Eloi, like Mara, are not consumed, but instead are used as“breeding vessels” for Morlock colonies (yuck). Alexander is reunited with Mara. Finally, the UM explains to Alex “You built your time Machine because of Emma’s death. If she had lived it would never have existed, so how could you use it to save her? You are the inescapable result of your choices, just as I am the inescabable result of you (? 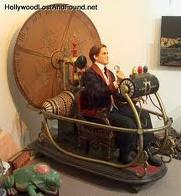 ).” He then shows Alex the Time Machine. “You have your answer. Now go.” At this point, Alex has to be thinking “I came 8,000 centuries for a lame explanation like that?” This is the first version that tries to adress paradox in time travel, but it completely ignores exerything besides Emma’s death that Alex changed by going back. Tell me this isn't scary. Long story short, Alex kills the UM. 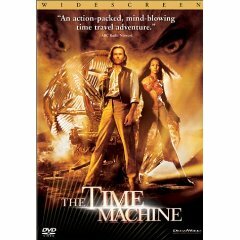 After outsmarting a creature that has demonstrated the ability to read and controll his thoughts, Alex uses his pocketwatch to jam his Machine. Mara asks “What are you doing with it?” He replies “Changing the future.” The jamming results in a sort of explosion of time, that rusts metal and rots Morlocks in the blink of an eye, and destroys their lair. This, while undeniably ham-fisted, is also undeniably cool. He saves Mara and they live happily ever after. 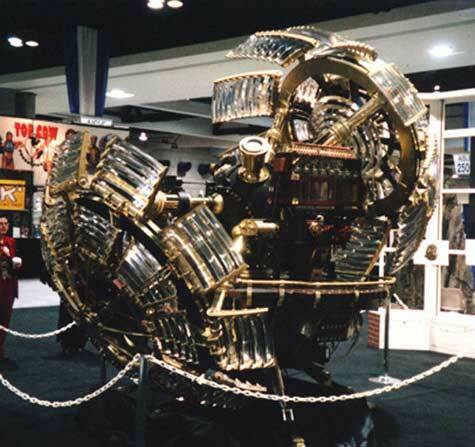 The Time Machine of 1960, now in a museum. expanding technology. Once again, the social evil warned of in 1899 creates havoc in the near future that forces part of humanity undergroud to evolve into monsters, who return to feed on those above. The time traveler once again abandons what he set out to find, and finds happiness in the time he has traveled to. All three versions suffer a certain weakness. The problem with basing a story that covers 800,000 years on a single societal concern should be obvious. 800,000 years eclipses all of recorded history aproximately 100 times. And yet, even the near future is hard to portray acurately. George Pal’s portrayal 1966 looks quite droll only 50 years later. Simon Wells’ portrayal of 2030 will no doubt look the same in 2050. It’s rediculous for a writer to asume that what’s on his mind at the moment will be shaping the world so far down the road. Good science fiction will, of course, include some social critisism, but there’s a reason most science fiction stories don’t take place so far into the future. The book comes the closest to acknowledging this, as it doesn’t try to tell a story that weaves all the centuries together. 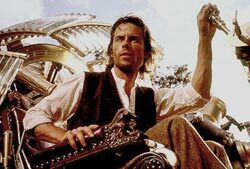 Wells’ hero simply leaves Wells’ time, goes to a time when the world was unrecognizable, comes back, and tells the tale. However, this also makes the book the least engaging and most depressing version. George comes home, looking how I felt at 1 am after finishing this review. For dramatic purposes, Pal’s version is a clear improvement over the book, because it takes the same basic plot and makes it into a story of rebirth, rather than degeneration, and of good triumphing over evil. It’s rather hard to buy the hippie philosophy 50 years later, however. The 2002 version seems to be the least preachy of the three, and while it does at times sacrafice thought for Hollywood sensationalism, it has some good messages about facing your fears and finding what’s truly important in life. Each version is a noteworthy embodiment of the values of its time. In sum, I would have to say I liked the version from my century the best. But of course, I would.